Tent caterpillars are moth larvae that live together inside protective silken tents. The pests attack a wide range of broadleaf trees and shrubs, making the foliage look unsightly and causing the host plant to defoliate. Various tent caterpillar species exist, including forest tent caterpillars (Malacosoma disstria), western tent caterpillars (Malacosoma californicum) and eastern tent caterpillars (Malacosoma americanum), but all species require the same mechanical, biological and chemical control methods. A close-up of a forest tent caterpillar crawling on a twig. Tent caterpillars overwinter as eggs on bare twigs, so help prevent future pest populations by locating the egg masses in the winter when you can easily spot them. The dark foamy-looking masses are about an inch long and completely encircle a twig. Either prune off the affected foliage or simply scrape off the eggs using your fingernails or a dull knife. 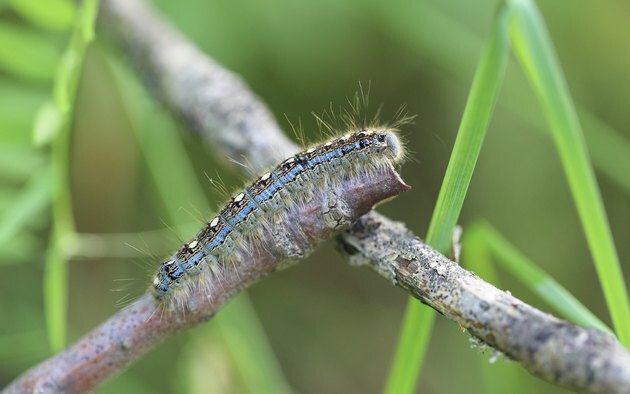 Pruning out small tents effectively gets rid of caterpillars, but wait until early morning or around dusk when the pests are inside of the structure and not out feeding. Disinfect your pruning tools between each cut in a solution containing 1 part household bleach and 9 parts water. Either drop the tent into a container of warm, soapy water or crush it underfoot before tossing it into a covered trash can. For tents out of pruning reach, use a strong stream of water from a garden hose to wash the pests right out of the tree. Tent caterpillars have many natural predators, including parasitic wasps, assassin bugs, parasitic flies and birds. Attract feathered friends to your yard by hanging birdhouses and bird feeders from branches of caterpillar-infested trees. Place birdbaths nearby and keep them filled with fresh water. Attract natural insect predators by planting flowering plants and herbs in your yard or garden. Beneficial insect-attracting annuals include basil (Ocimum basilicum), borage (Borago officinalis), baby's breath (Gypsophila elegans) and dill (Anethum graveolens). Include perennials such as catnip (Nepeta spp. ), which grows in U.S. Department of Agriculture plant hardiness zones 3 through 7, and garlic chives (Allium Tuberosum, USDA zones 3 through 9) in the flowering mix as well. Large trees or those with several tents might require a spray treatment to get rid of the pesky caterpillars. Bacillus thuringiensis var. kurstaki, a biological insecticide containing soil-borne bacteria, selectively kills caterpillars while not affecting humans, pets, birds or beneficial insects. Follow the instructions and safety precautions on the label. One product recommends mixing 4 teaspoons of Btk for every 1 gallon of water. Use a handheld sprayer to thoroughly cover all foliage surfaces. Spray Btk once a week until you no longer spot caterpillars feeding on plant leaves. Btk works best on small caterpillars, so spray affected trees and shrubs as soon as you spot new tents. Apply Btk in the early morning or around dusk when most of the pests will be inside of the tent. Although nontoxic, Btk can still cause eye and skin irritation on contact. Wear goggles, waterproof gloves and protective clothing when mixing and spraying this product. Apply spray treatments only when no precipitation is expected in your area for at least 24 hours. Avoid using a broad-spectrum insecticide to treat tent caterpillars. Although traditional pesticides can offer quick, long-lasting results, the chemicals will kill the beneficial insects along with the caterpillars. Don't kill any caterpillars you spot with white cocoons or eggs on their backs, because they are hosting parasitic insects that will soon hatch and take care of the larvae pests for you. Wear work gloves when handling caterpillar tents. You might make contact with the caterpillars, and the pests sport hairs that can irritate the skin of sensitive people.